When servo-driven mechanical presses debuted in North America roughly two decades ago, they were high-ticket items shrouded in mystery. Tales from Europe and Asia detailed dizzying capabilities promising the benefits of hydraulic and mechanical presses, all in a single machine. However, the steep learning curve, tough economic times and the technology’s high initial cost contributed to a slow adoption rate in the United States. Fast forward to the beginning of 2018. Due to the evolution of servo-motor technology, and those who have applied it to part-forming applications, these power providers can replace the various drive mechanisms used to propel a press ram. By itself, a servo motor can control velocity changes in the ram as well as starting and stopping functions. That capability leads to a multitude of advantages for metalformers. Ever-learning and ever-improving, metalformers have realized just what servo-driven mechanical presses can provide, thanks to a concerted effort by suppliers and the industry to educate potential customers and design reliable, affordable technology. Today, savvy metalformers dig deeper, finding new ways to leverage servo-driven presses for specific applications and set themselves apart from the stamping pack. Most metalformers are familiar in general with the ability of servo-mechanical presses to precisely control slide motion throughout the stroke and tonnage generated on a workpiece. Via a servo press, metalformers can optimize the press cycle for different applications by adjusting slide motion. The specific results of this capability have been outlined in Study of Servo Drive Press Technology—A Review, a report recently published in the International Journal of Innovative Research in Science, Engineering and Technology. “The flexible programming of a servo drive press allows (users) to set the most suitable forming velocity for the given forming operation and material; dwell the slide anywhere in the stroke at the desired stroke position; carry out secondary operations; and provide the necessary time for part transfer,” it reads. Instead of shaping material into forms via brute force, controlled slide motion of the servo press enables material to flow into a form. As a result, unique aspects of a particular part or forming operation can be accounted for during job programming, allowing for smooth press operation with relatively less stress on tooling while delivering parts that can approach the tolerances and accuracies of fineblanked parts. The ability of such presses to dwell–at any point within the press stroke–enables the time necessary to conduct accurate and high-quality secondary operations such as tapping or fastener insertion, for example. Beyond creating a tight-tolerance part, this adds to process value without the need for costly and time-consuming off-press secondary processing. Servo-press technology also offers other ways to positively affect part quality. Consider deep drawing. By combining servo presses with die cushions, blankholder force can be varied throughout the deep-drawing steps. Changing the blankholder force—matching cushion movement to the speed of the slide—enables optimum blankholder force throughout, in step with the slide motion. Thus, wrinkles and fractures can be avoided. During blanking, servo presses can eliminate burrs by increasing slide speed near the point of impact. In addition, because tight punch-die clearances reduce the likelihood of burrs, specific slide and motion programming can ensure that such clearances are maintained. Springback, common especially in higher-strength materials, affects the dimensional accuracy of parts, and can be minimized via servo-press use. Programming variable velocity, as well as dwell or bottom-dead-center positions, helps reduce springback effects. And, servo-press technology enables a shortened forming cycle, as a short stroke can be dialed in near bottom-dead-center, with higher slide speeds during return. Tool-life improvements, like so many other advantages inherent in servo presses, arise from slide-motion control. Controlling punch velocity during forming reduces tool-wearing heat generation arising from friction, not to mention the probable increase in scrapped bad parts. And, slide motion tied to a particular application helps ensure minimal stress on die components, reducing the likelihood of tool breakage and resulting costly downtime. In general, the ability to reduce the touching speed of the tool to a workpiece will extend tool life and avoid high impact loads. In addition, optimized slide motion reduces the chances of vibrations occurring in the work material, which, again, can impact tool life and part quality. And, servo presses, with programmable slide motion, can form parts at lower tonnages than more static mechanical presses. This also aids tool longevity. Part recipes with customized motions and slide velocities enable more work to be performed in fewer die stations. This can lower tool-build and -maintenance costs. As servo presses continue to become commonplace, more tool designers and builders are creating dies specifically to take advantage of the technology. More and more operations can be fitted into servo-press tooling, leading to greater productivity gains while further reducing the need for out-of-press secondary processes. Getting the most out of tooling in servo-press operations—and out of the servo press itself—means optimizing. Of course, experimenting and refining, which leads to optimized job programming, is a tough sell when testing must occur on the shop floor. That’s why some metalformers opt for servo presses as tryout equipment. Besides self-optimization, servo-mechanical presses can mimic the actions of traditional hydraulic and mechanical presses, making them ideal as tryout machines. 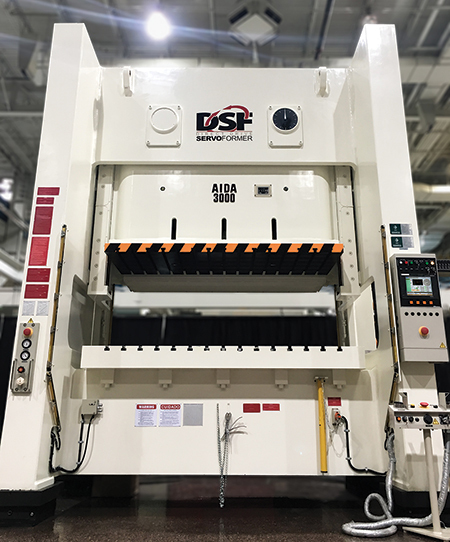 In one case, seeing the trend toward common use of servo presses, a toolbuilder decided to replace an offline-for-repair 400-ton mechanical press with a 330-ton servo model. While the immediate goal was to use the new press to make adjustments to traditional tooling, ultimately the servo press would serve as an R&D project leading to new press-specific tooling and new ways to leverage servo-press technology. The press also simulates press rates provided in the toolbuider’s customer quotes. This has helped reduce final tryout time in customers’ presses. One company taking advantage of servo-driven-press technology is Automation Tool & Die (AT&D), Valley City, OH. In 2013, after researching the technology and seeking to prove out the advertised advantages related to part quality and process productivity, it purchased an Aida DSF-N2-3000 330-ton direct-drive ServoFormer. The two-point straightside press can produce at speeds from 1 to 100 strokes/min., and features a 102-in. (left-to-right) bed and 25.6-in. die height. With the ServoFormer, unlike flywheel mechanical presses, excess energy through the nonworking portion of the press stroke is stored in capacitors. As the press idles, power consumption is minimized. This regenerated-energy design lowers operational costs and conserves electricity, according to Aida officials. Reported results include lower operating costs as compared to mechanical and hydraulic presses—30-percent savings in kWh and as much as a 70-percent reduction in peak load. Encoders located at the motor and the crankshaft provide redundancy to help ensure against unintended motion that affects part quality and possibly damages tooling and press components. Bringing a servo-mechanical press inhouse allowed AT&D to assess the technology’s performance, which would determine whether the company would migrate to higher-tonnage servo-driven units. Satisfied that the press delivered more rapid production of higher-quality parts while extending tool life, in 2016, AT&D again went the servo route. This time, it opted for a 700-ton Aida DSF-M2-6300 straightside press, featuring a 168-in (left-to-right) bed and speeds to 75 strokes/min. Offering infinitely programmable stroke and velocity profiles, AT&D can program constant velocity for forming applications or use standard programs to ease setup and operation. Programming technology enables increased production rates at shorter stroke lengths, according to Aida officials. Similar to the 330-ton servo press, the 700-ton press also benefits from capacitor-stored energy. In addition, both presses feature automated coil-feed lines from Dallas Industries.